Peter Bosscher, faithful Christian, compassionate engineer and professor, loving father and friend, passed away Sunday morning, November 18, 2007, in his home, surrounded by his family. Peter was born November 25, 1953, in Grand Rapids, MI. 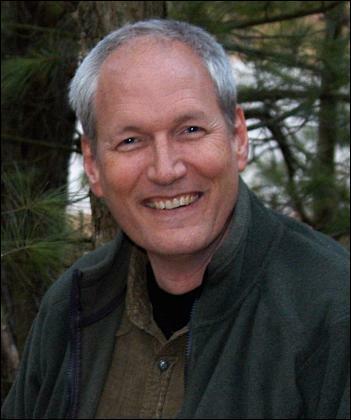 He attended Calvin College and graduated from U-M where he received his Ph.D. in Civil Engineering in 1981. For the next 26 years he taught engineering at the UW-Madison. While his professional expertise was in soils and foundations, his career was defined by a passion for helping people. 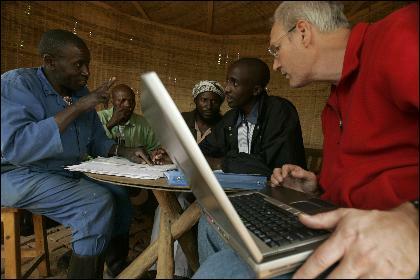 In 2002 he initiated a chapter of Engineers Without Borders (EWB) in Madison. It was his joy to see engineering students, including his son Nate, transformed as they worked with communities in Ecuador, Costa Rica, Thailand, and Rwanda. In 1977, Peter married Marcia Vermaire. He was the proud father of Nathan, Anne, Georgia, and Toney. He was an active member of Geneva Campus Church. Peter will be dearly missed by his wife, Marcia; children, Nate (Alicia) of Washington, D.C., Anne, Georgia, and Toney, of Madison; his parents, James and Ange Bosscher of Grand Rapids; his siblings, Jack (Joan) Bosscher, Beth (Bob) Terborg, of Grand Rapids, David (Mary) Bosscher, of Zeeland, and Barb (Steve) Timmermans of Palos Heights, IL; the Vermaire family, many nieces and nephews, friends, and colleagues. Engineers Without Borders Fund: Contributions should be designated to the Peter J. Bosscher Engineers Without Borders (EWB) Fund and sent to UW Foundation, 1848 University Ave., Madison, WI 53708. Geneva Development Fund: The goal of the Geneva Development Fund is to secure a permanent home in the campus area for Geneva Campus Church, a CRC congregation which welcomes and enfolds students. Checks may be made out to Geneva Campus Church, designated in memory of Peter J. Bosscher, and sent to Geneva Campus Church, 1127 University Ave., Madison, WI 53715. The Wisconsin Idea has permeated the University of Wisconsin-Madison ever since former UW President Charles Van Hise communicated the idea that a student’s education should influence people’s lives beyond the confines of the classroom, saying, “I shall never be content until the beneficent influence of the University reaches every home in the state.” I think that if Van Hise were speaking today instead of in 1904, he would declare that our education can reach far beyond our state line to the homes of people across the globe. 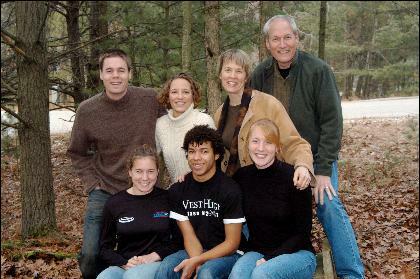 My friend from Chadbourne Residential College, Laura, invited me on a trip to Guatemala with eleven others from the University of Wisconsin-Madison over Christmas break my sophomore year. I admit I had lived a sheltered life and did not fully appreciate all the things I was blessed with. I didn’t really know what I would learn, but I knew the trip would be well worth the cost. With a mixture of fear and excitement, we arrived in San Lucas Toliman, Guatemala to begin our work. Even in the eighty-degree weather, we were told to always wear jeans. That was a wise decision as we were told to haul rocks and soil the majority of the next few days. In the following days we would also bend rebar and visit people around the city. One of my favorite memories of the trip was an invitation to dinner with a Guatemalan family. Even though their home was one room and they made very little money, they brought our team of twelve “gringos” over for a great meal of chicken and other homemade items. Despite their poverty, they were willing to give up their home and their money for people who possessed so much more. Their generosity overwhelmed me; never had I seen such a loving act. The joy of that family even in the midst of poverty surpassed that of many families with far more material possessions. Besides giving me a stronger hold on the Spanish language, the trip changed my perspective in many ways. I have a much greater understanding of my many blessings and a much greater acceptance and appreciation of other cultures. After my trip, I changed my major from mechanical engineering to civil engineering to better work with people and improve the lives of others. One of the first civil engineering professors I had was Professor Peter Bosscher, whom I had remembered from my freshman year. He spoke at a gathering of various student organizations campaigning for students to join their club; most boasted of great connections and free food. However, one of these presentations, made by Peter, was different. He talked about using engineering to make a difference in the lives of others. That intrigued me, but that idea did not mesh with the NASA career I had in mind at the time. Taking Peter Bosscher’s Engineering Sustainability class was one of the best decisions I made in college. He talked about the importance of a worldview and our own motivations for making the world better. He emphasized acting not as a possessor of the world, but as a caretaker in awe of creation. After talking with Peter in his office one afternoon, he spoke of an organization with an active chapter at the University of Wisconsin called Engineers Without Borders, an organization that lived and breathed the sustainability topics we talked about in his class. Though I felt totally unqualified, I soon found myself the project manager for the El Salvador project. Peter’s health greatly declined that spring semester while I was in his sustainability class. Realizing that his time was drawing short because of kidney cancer, I found a sense of urgency to hear as much wisdom as I could from Peter that summer. Most Thursday nights, my good friend Jon and I would bike to his house and soak in as much as we could regarding our Engineers Without Borders project and beyond. I look back at those evenings with great joy. Responding to our inquiries about various Civil Engineering Capstone courses to take that upcoming spring, Peter told us of a recent project of his—a water supply system in Ecuador. Having gone down to Otavalo in June 2006, Peter was hoping to return to finish the project sometime in 2008. Foreseeing that the kidney cancer would prevent a return trip, he handed off the project for us to complete. Peter unfortunately passed away this past November, a week short of his 54th birthday. He was unable to see the results of our El Salvador trip this past January or our Ecuador trip this past June. It was an honor to carry on his legacy by completing his projects. In El Salvador we installed 500 meters of PVC pipe, which will connect two communities to an existing wastewater pipeline. With continued construction throughout the next year, the hope is that the two communities will see improved health and sanitation as the wastewater will enter the PVC pipe rather than collect in the streets. During the Capstone water supply project in Ecuador in June, more than one kilometer of PVC pipe was replaced with larger diameter PVC pipe, allowing increased flow to five communities. Additionally, a more equitable water system was created by installing water meters at the entrance to each community, which offers the ability to monitor and control the amount of water entering each community. Inspired by these experiences, this fall I will be entering a master’s degree program in civil engineering that includes two years of service in the Peace Corps. After the Peace Corps, my goal is to live a life of service, working alongside disadvantaged communities towards a common community goal–living out the Wisconsin Idea and using my education to make a difference across the world. I am thankful I was able to be inspired and directed by Peter Bosscher to do greater things than I had thought or imagined coming to this University. Some results of his teaching to his students are physical: the wastewater collection system in El Salvador and the water supply system in Ecuador. But more importantly I was able to be a part of the heart and passion for a sustainable and beautiful world that he instilled in his students, a gift that will continue to be passed on far beyond his lifetime.